More than twenty years ago, I spent my last $400 on this. It was money I'd saved to run away from home, to get a divorce and get my life back. And there, in a sand stream, in the middle of the San Francisco Landscape Garden Show, was this time-washed face, carved by Marcia Donahue. And there it was. It was the last unsold boulder in her sand stream. The features are faint; you can only see them in oblique light. How Marcia found my mother's drawings and translated them into stone is still a mystery. I have another of her sculptures now, a huge tranquil face purchased much later, made just for me.. It sits just outside my kitchen window. I love it, it calms me. But this one spoke to me like a jolt to the heart. The problem was, it had never found a comfortable place in my garden. At the base of the dogwood it just looked like a stone. Propped against a hedge it became a doorstop. It had never found a home - until now. I was cleaning up for a party and I had the stone tucked under my arm, looking - again - for the perfect place, a place where it would feel right. Look right. Be comfortable. Sit well. 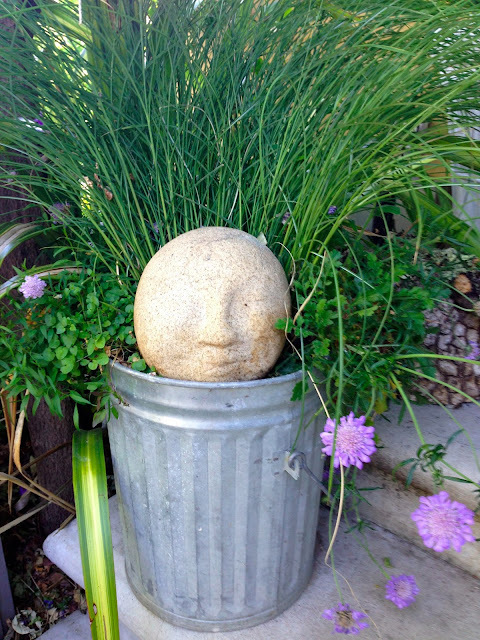 As I walked past the Miscanthus in an old galvanized pail (trash can), I pulled out some spent pansies with my spare hand, and left a big lot of bare dirt in the pot. Front and Center. Oops. So I set the face in the bare spot and went inside, and when I walked out the door later her smile stopped me in my tracks. She is perfect. Thank you mommy. For all the sandwiches, filling up to the edges and cut on the diagonal. For fevers weathered together, for fudge beaten on the back steps. For sleeping outside all summer, for dresses loaned (and sometimes ruined - sorry!) for skirts altered for cello recitals. For perfume removed from purple prom dresses. For always being there. With a smile. I adore you. You are my best friend. I love you so much. In a burst of enthusiasm - a big garden! unlimited space! (well not really, but that, as Des says, is a Whole 'Nother Oprah) I planted a bunch of citrus trees. Since I'd been making marmalade for years and buying blood oranges (I know, I know, Seville oranges, but wait 'til you taste this! and the color is divine). Anyway, as I was saying before I got carried away, I got a bit carried away (not me!) and I planted three blood orange trees. One Tarocco, one Sanguinelli (even the name sounds bloody) and one Moro. What I didn't know is that they would all come ripe at the same time. Maybe not in your garden, but here? Yes. Definitely. And since they're more than ten years old, we get a lot of oranges. 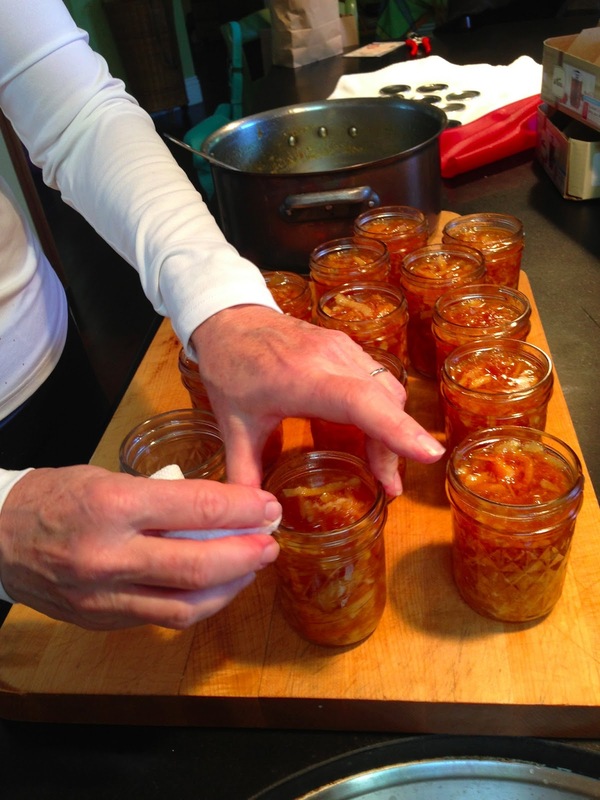 So I have been making marmalade. 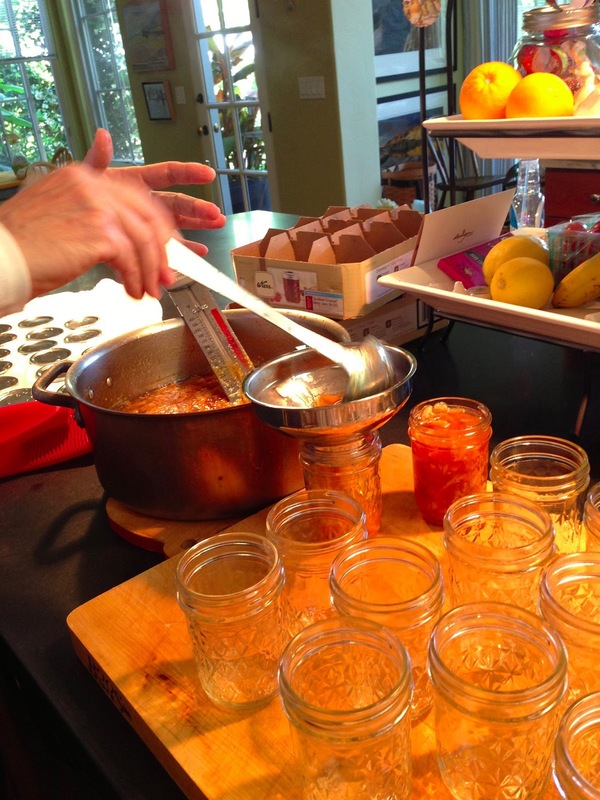 Lots and lots of marmalade. With Cathy, my partner in Jam (the most fun), by myself late at night - inevitably the batch you start latest takes the longest to finish. That must be Murphy's Law Of Marmalade. You heard it here first. I started with a recipe and I've changed it over the years to suit my taste. Feel free to do the same. If your turns out better (not bloody likely) let me know, share your tips. ...organic and from a nearby garden if possible. Washed, stem buttons removed. Yes there will be a recipe. Patience please. Cover whole oranges in the kettle with water and simmer until easily pierced with a fork. Forgot to photograph that part. But if you can't do that part without a photo you probably should back slowly out of the kitchen and take up needlepoint. On second thought try something that doesn't involve sharp objects. As you're cooking any pits you've missed will float to the top. Different specific gravity. Who knew there would be a physics lesson? Plus the pits have a very red base so they're easy to see. I fish them out with a teaspoon, the wooden spoon just chases them around. So high school. Look how many I missed when I was slicing! I also took out a rather unattractive orange bottom. How would you like to see that on your toast? Could put you off marmalade for life. Not good. When you've made this a few times, you can tell by the thickness of the syrup when to start paying attention to the thermometer. Not that I've ever burned anything...not me. 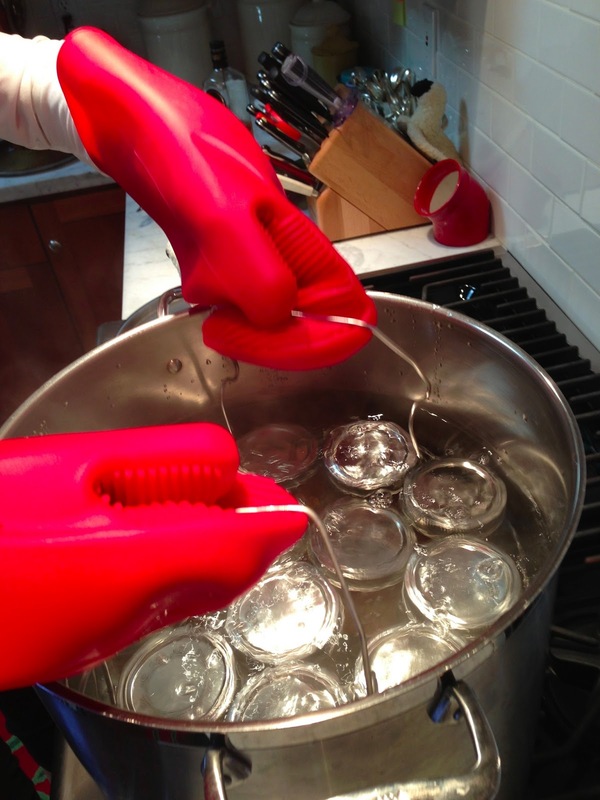 Fill hot clean jars - I use the dishwasher, first to clean, then on the plate warm cycle to keep the jars hot. Cold jars will crack. Trust me on this one. And if you don't have a canning funnel, get one. Wipe the rims with a damp towel - I use paper. Put on the lids, tighten the rings. Pretty tight - you don't want the jam leaking out. Just the air. I still use a canning rack, even tho the little jogs in the handle that supposedly let you hang the rack half-out of the boiling water are actually just there to tip the jars over when you lower them into the water and the handles have to come in. Machiavelli must have made marmalade. Or canning racks. I have these handy silicone mitts my friend Pam gave me. I don't think I could get the jars in the water bath and all standing upright (very important!) without the mitts. Thank you Pam. And you can see the handles trying to tip over the jars. Honestly, does anyone who designs this stuff actually test drive it? Apparently not. Ten minutes in the water bath, then onto a towel to cool. If you put them directly on a granite or marble counter you risk cracking the jars, and after all this work I'm not taking any chances. Another dozen jars of marmalade. It's actually deeper in color and prettier than the photo but it's late and I'm too tired to fuss with the photo. Home grown, home made. Delicious, and properly sealed so you can store them in the wine cellar. Won't your husband be thrilled! Or in the pantry. Not as much fun. Sometimes I add some Scotch. This time I meant to add Irish Whiskey but I forgot - it goes into the kettle at the end, after all the cooking, and if you're like me, things get a bit chaotic then - looking for lids and jar rings and tongs, taking the hot jars out of the dishwasher and burning my fingers...you get the idea. So here - finally - is the recipe. Oh, and check out the labels available at My Own Labels.com! You must have a candy thermometer to make this. !!! Wash the lemon and oranges well. Cut off the woody bit where they were attached to the tree, put them in a large non-reactive dutch-oven sized pan, add enough water to cover and simmer until tender enough to be pierced with a fork. Let the fruit cool. If you remove it from the juice it's less messy to slice because it's less juicy, but I am lazy and let them cool in the juice. When the fruit is cool, cut them in half the long way, remove and discard the seeds, and slice thinly. Before you start slicing, put your boiling water bath canner on to heat, because it's going to take a lot longer than you think. Return the oranges, lemon and the juice to the kettle and bring to a boil. Immediately remove from heat, and if you are adding scotch, pour it in now. It will foam up and boil off the alcohol. Stir until the fuss dies down. 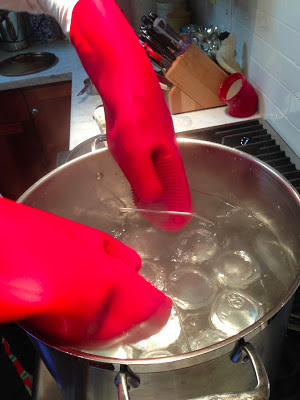 Ladle into hot sterilized jars with two piece lids. Put on the lids and process for 10 minutes in boiling water bath. 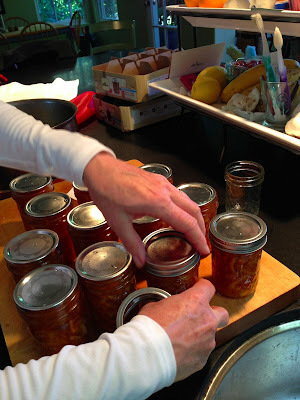 Makes about a dozen half pint jars. Our Italian class came over for dinner a few nights ago -it was a potluck in the garden. An Italian potluck in the garden. Highly recommended. Much less stress for the hosts, fabulous new recipes. Laughter, stories, more laughter. What's not to like? Margaret was standing in the kitchen leaning against the counter, talking to Barbie about multi tasking. I was taking lasagna out of the oven, pulling serving spoons out of a drawer, only half listening. Until I heard her say: "Hey, when I sneeze, I pee. And if that's not multi-tasking, I don't know what is." It's good to have friends. It's great to have friends who bring dinner. And Gina Stearly's Italian class - it's the best. Here's to you.